Registration is now open for Digital Signage Expo (DSE) 2014. The Expo will take place at the Sands Expo & Convention Center in Las Vegas, February 11-13, 2014. 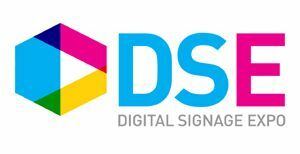 The theme for this year’s show is, “Achieving Digital Signage ROI Success.” The theme will play a role in many of the seven DSE 2014 educational seminar tracks. Speakers will discuss the different ways that return on investment (ROI) and return on objective (ROO) impact decision-making, while offering forward-looking perspectives on the industry. Four new full day pre-show conferences have been added to this year’s program for a total of nine to be presented on Tuesday, February 11th. In addition to the seminar curriculum, DSE 2014 will feature 11 pre- and post-show programs, 14 free on-floor workshops, 60 Industry Vertical Roundtable Discussion Groups, and a program of study designed to ensure certification renewal in cooperation with the Digital Signage Experts Group.